Hubby and I miss Europe. We want to go back, like, right now. Almost every day one of us will say "I miss Europe, let's go back tomorrow". Sigh. If it were only that easy. To comfort our Europe cravings, I decided to try my hand at one of my favourite Italian dishes: risotto. I served the risotto with a cold glass of the remaining white wine and a fresh caprese salad - a favourite of ours that we ate almost daily while we were in Italy. coffee table dinner. we're classy like that. It was creamy, comforting, and for a second I thought I was back in Italy. Until I remembered that I had to go to work tomorrow. Oh well, for now, I have risotto. Hubby and I both agreed that this dish was good, but it would be even better without the dried mushrooms. Next time I would just discard the dried mushrooms after soaking them in the water, rather than adding them to the risotto itself. I also chopped and measured all my ingredients before I started cooking, which I found allowed me to really focus on the risotto itself. You can reserve a few cups of the finished risotto to make risotto cakes or arancini. I made the risotto cakes a few days later and they were lovely! Definitely do this. Soak the dried mushrooms in 1 1/2 cups hot water in a bowl until softened (about 20 minutes or so). Once soft, lift the mushrooms out and squeeze the liquid back into bowl. Rinse the mushrooms to remove any grit. Coarsely chop. Pour the mushroom liquid through a sieve lined with a dampened paper towel (or a coffee filter) into a saucepan. Add the broth, soy sauce, and remaining 21/4 cups water to the saucepan and bring to a simmer. While your broth mixture is heating up, heat oil with 1 tablespoon butter in a separate, heavy pot over medium-high heat until foam subsides. Add onion and sauté until just softened (about 5 minutes). 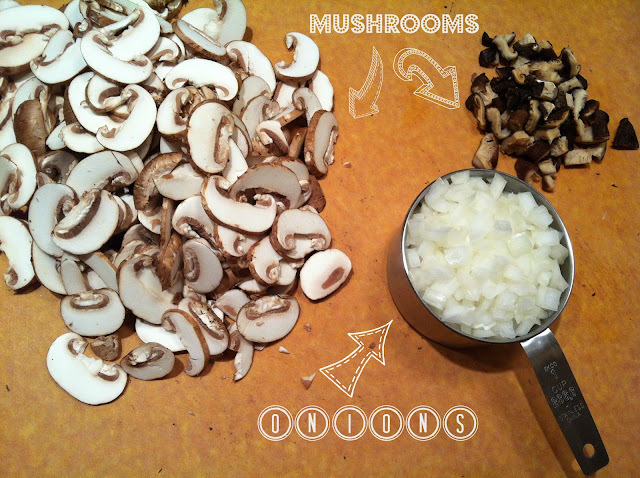 Add garlic and fresh mushrooms and sauté until mushrooms are browned and any liquid is evaporated (about 8 minutes). Stir in the (previously) dried mushrooms and cook for about 1 minute (or don't - think it would be nicer without them). Add rice and cook for another minute. Add wine and stir until absorbed (about 1 minute more). Stir 1 cup of the simmering broth mixture into rice. Stir constantly and keep at a strong simmer, until liquid is absorbed. Continue cooking and adding broth mixture (about 1 cup at a time) stirring frequently and letting each addition be absorbed before adding next, until rice is tender and creamy looking but still al dente (about 18 to 20 minutes). Thin with some of remaining broth, if necessary (you will have about 1 cup left over - I found I didn't need it). Remove from heat and stir in cheese, salt, pepper, and remaining 1/3 cup of butter until butter is melted. Top with a little more Parmigiano-Reggiano and serve immediately. If reserving some risotto to make risotto cakes or arancini, set aside 3 cups and cool to room temperature, then chill, covered with plastic wrap.